Workplace Insanity: Bad Breath Is Better Than No Breath At All! On any given day you will see many ads on TV for mouthwashes and toothpastes that purport to help eliminate bad breath. 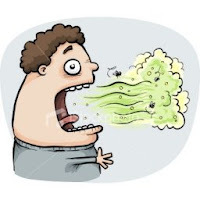 Bad breath is presented by advertisers as a near-fatal condition that can have severe impact on your social life, and can cause people to quickly run away from you shrieking in horror. It is a condition that even your best friend is often reluctant to tell you about. According to the ads, it is something to be absolutely avoided at almost all costs. However, it is often useful to put things in proper perspective. While having bad breath may not be good, it is certainly far better than having no breath at all! OK Tom, what’s your point and how does it relate to workplace insanity and the workplace in general? Well, we often find ourselves in situations with two or more highly undesirable choices and need to make a decision on how best to proceed. Putting a proper perspective on those choices can often make such choices easier. For example, a product, program, or project may be running late (though I recognize that this seldom happens with yours' J), and being late may significantly impact revenues that can be generated (see also Ineffective Engineering Costs You Time, Money, and Customers!, and Late Projects Kill Companies!). The choices in this case are whether to release the product, program, or project late (bad breath), reducing the net revenues and profits that can be generated (see Keep Your Eyes on THE GOAL! ), or cancelling the product, program, or project entirely (no breath). This decision is not necessarily obvious, but should be dispassionately examined (see Pound the Facts, Not the Table). If there are still significant profits to be made even with the delay, then it makes sense to continue, but lessons should be learned on better estimating and delivering on schedule commitments. If the projected profits are substantially reduced or even eliminated by being late, then cancelling entirely may be the right choice. Even in this case, the impact of not having a product, program, or project in this market area must be carefully assessed to determine whether dropping it entirely may have a long term adverse effect. Another, less draconian, example could be dropping some features, even if they are considered important, in order to release a product, program, or project on time. The choices in this case are whether to release on time with a reduced feature set (bad breath), or to delay the release but deliver it with all of the planned features (a different kind of bad breath). In this scenario it is necessary to determine whether the release date or the features are most critical to the success of the product, program, or project (see also What Do Your Customers Really Want? and Does Everyone Really Understand?). Depending on the situation, either may be the case, and again, a dispassionate analysis must be performed. A similar example in the other direction could be adding some critical features, late in the effort, at the cost of delaying the release, if it is determined that these features may be essential to the success of the product, program, or project. It may be that a competitor just released something similar with these critical features, and that without them your product, program, or project may not be able to as effectively compete. Again, it will be necessary to determine whether timely release without these features (bad breath) is more critical to success than delay with these features (a different kind of bad breath). Another variation is a product, program, or project coming in at a higher cost than projected. This may cause you to increase your price (bad breath), or to reduce your margin and thus reduce your profit (a different kind of bad breath). Raising your price may make your product, program, or project less attractive than your competitors', depending on the competitors' features, thus reducing your sales revenues. Reducing your margins will reduce you profits and may even make the product, program, or project unprofitable. Some possible choices in such a situation include implementing a cost reduction (immediately or soon after initial release) to reach or improve on your initial projections (bad breath), dropping some features to achieve cost targets (a different kind of bad breath), or killing it entirely (no breath). Once again, a dispassionate analysis of these and other options must be conducted to determine the best approach for your company. Similar situations may arise that relate to quality issues. You may determine late in the process that your product, program, or project does not perform as desired due to problems with quality. Shipping with known quality problems can severely damage the reputation of your product, program, or project, and the company (see also Poor Quality Products Imply A Poor Quality Company and You Only Get One Chance To Make A Good First Impression!). That this happened indicates that you have problems in your development processes that must be immediately investigated and corrected (see also Development Methodology Basics: Stages of Development, and Development Methodology Basics: Management of Development, and Development Methodology: Test – To Verify, and Quality By Design!). It is highly likely that it will be necessary to delay the release to correct the problems. This then becomes a choice similar to the first example – to release late (bad breath), or to cancel entirely (no breath). Choices are seldom just black or white. There are many factors that impact decisions that will need to be made. Putting your choices in perspective, looking at the choices dispassionately, and performing a careful analysis of the choices and their impacts on all aspects of your business are essential. By properly analyzing the choices, you can determine whether bad breath is better than no breath at all.